Ann Koenig collects tomatoes from her backyard garden as part of the Woods to Table project. 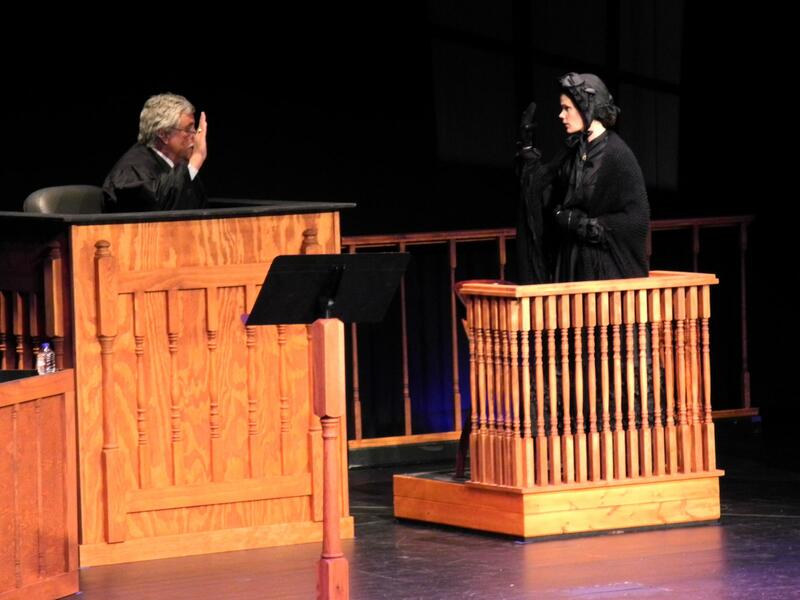 Ill. appellate judge Thomas Appleton swears in Mary Surratt (Aasne Vigesaa) during a civilian retrial at the Abraham Lincoln Presidential Library and Museum. On a late Friday afternoon sun streams through the windows in Fred and Ann Koenig’s kitchen. Ann is deep in preparation for tonight’s meal, which is somewhat different than what the Koenig’s might normally serve up. It started with "Cooking Wild In Missouri" from Bernadette Dryden. “I saw the book and just thought it was fantastic. it’s not standard in that there’s ceviche in here, there’s Caribbean catfish, catfish goes to China, I mean there’s just so many different kind of recipes,” said Ann. But here’s where it gets even more challenging—they’ve given themselves a year to cook their way through the book and then blog about it. And tonight Ann's cooking two of them: penne with butternut squash and upside down pear pecan gingerbread. The project is an extension of eating locally says Ann, which is something that they already do and has been a culinary adventure so far—they’ve cooked squirrel, sought the help of a “fish whisperer,” and tracked down paw-paws. Ann does most of the cooking, while Fred hunts. They both do the gathering and the blog writing. He said the project has allowed him to get outside with his sons for things like fishing and hunting. Curious how the rest of the project will go? Check out Woods to Food where they’ll be faithfully blogging it. On July 7, 1865, Mary Surratt became the first woman executed by the federal government when she was hanged for her role in the assassination of Abraham Lincoln. Surratt owned the boarding house in Washington, D.C. where many of the conspirators lived and met. Her own son John was an active participant in the plot. But the depth of her involvement was as hotly debated then as it is now.